There are many times making your own corset kit comes in handy. Need a corset? Need a perfect match to your fabric? Then making your own corset kit might be the answer for you. 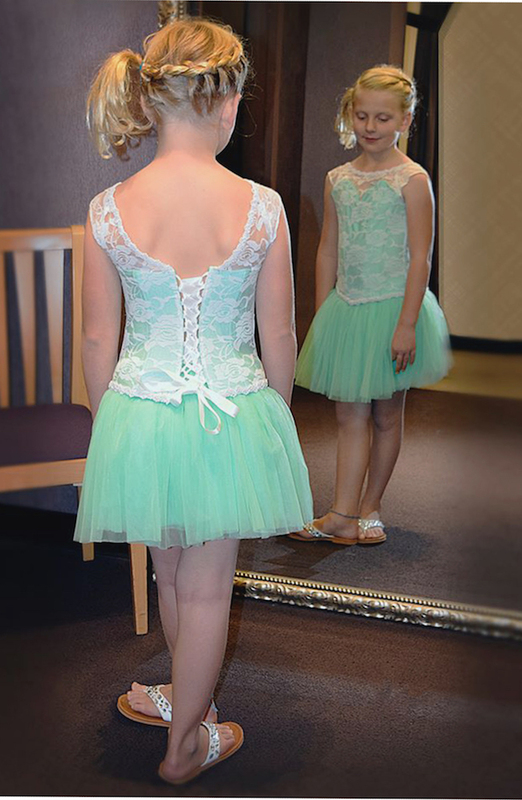 This tutorial for a corset kit was originally featured in our pageant wear pattern Katherine. 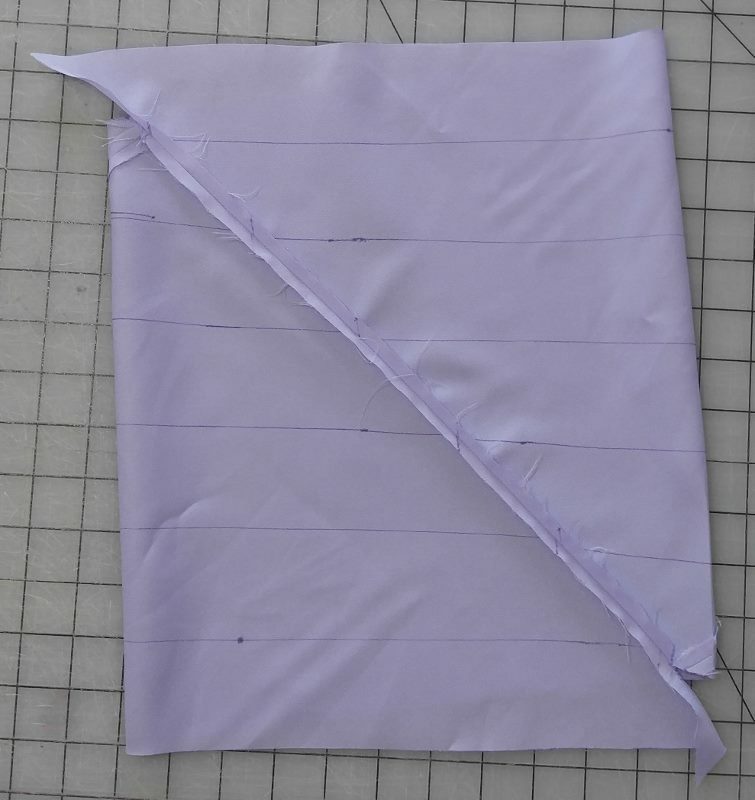 However, you can use it in place of any corset to add a perfect match to many of our other patterns such as Gracelynn, and Lilac. By removing the center back panel, you can also add it to Odette. This will not stay in the finished corset, so color doesn't matter. 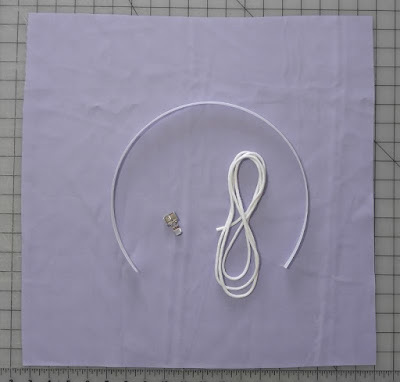 The size of the cording will determine the finished size of your loops. I prefer to use 3/16" cording. You may go a little bigger to make it a little easier to turn. 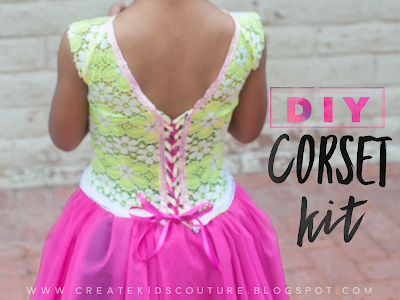 You will want the cording to be 4.5 times the length of your corset. Cut your boning to be 2 times the finished length you want the corset plus 4". 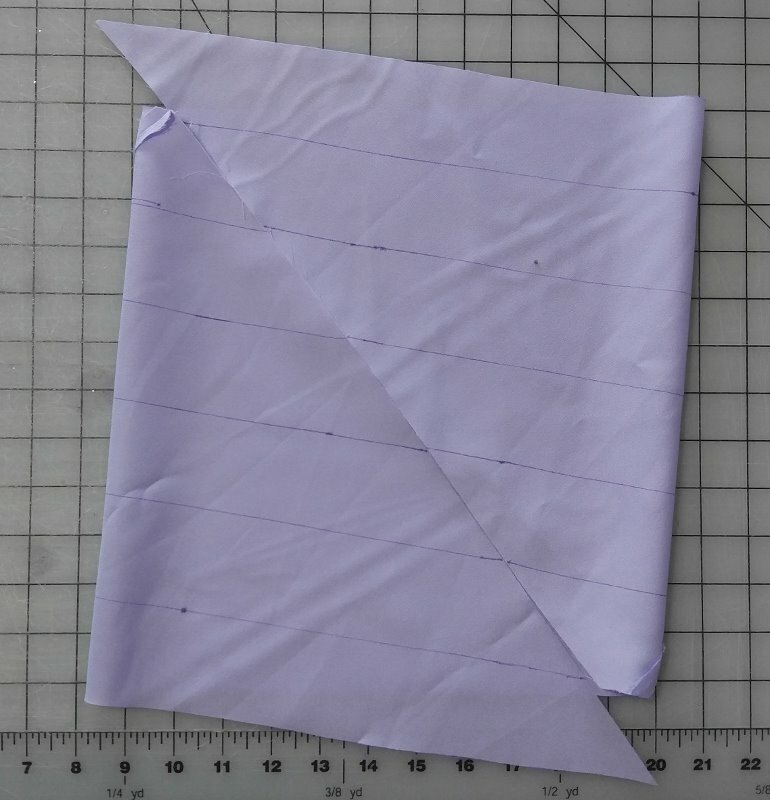 So if you want the corset 10", cut the boning 24" long. We will start by making continuous bias tape using the directions below. If you are visual learner and would like to watch one of our Youtube tutorials using the same method, check out the video below and catch back up in Step 9. 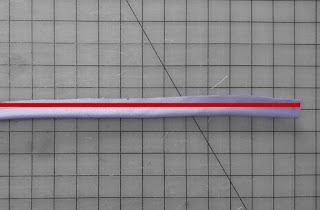 Step 1: First we will need to create a 2” bias stripe with which we will be working with. 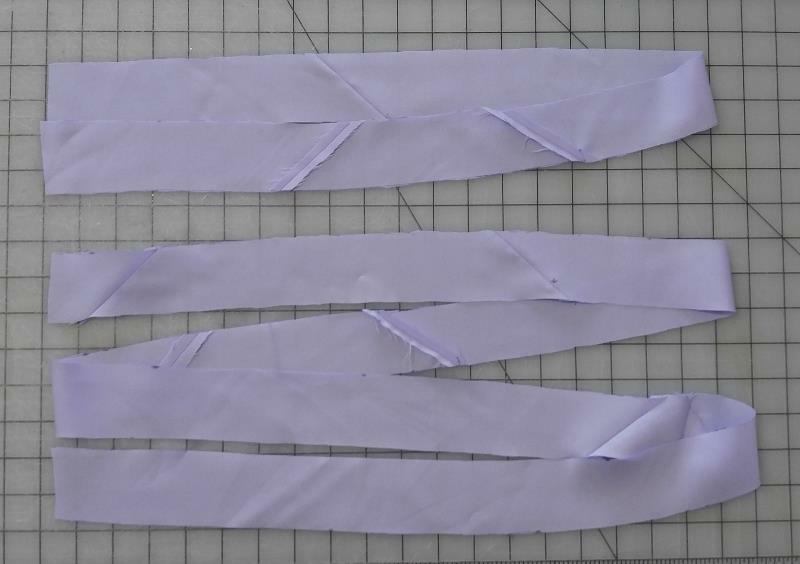 It is very important that this is cut on a bias so the corset loops and tie will lay flat and smooth. To do this take your square and draw a line dividing the square into two triangles as shown. Mark the top and bottom of the square with an X. 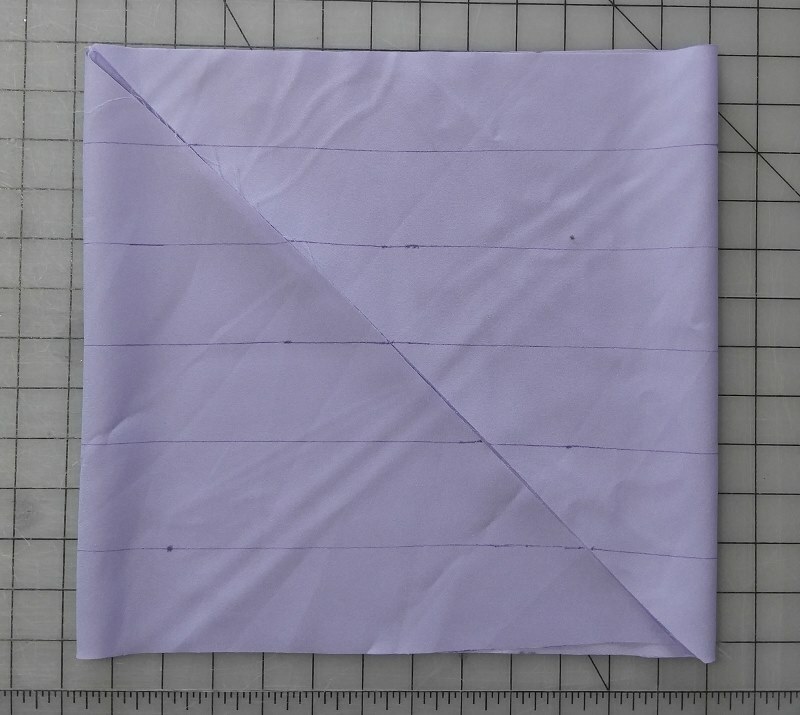 Cut the square in half along this line. 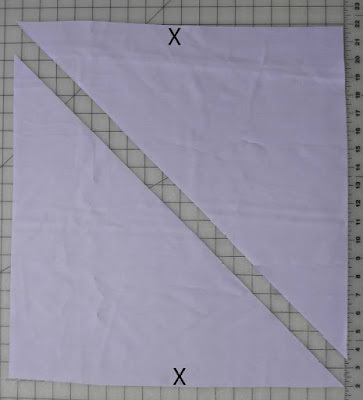 Step 2: Now place your triangles right sides together, matching the X’s as shown. 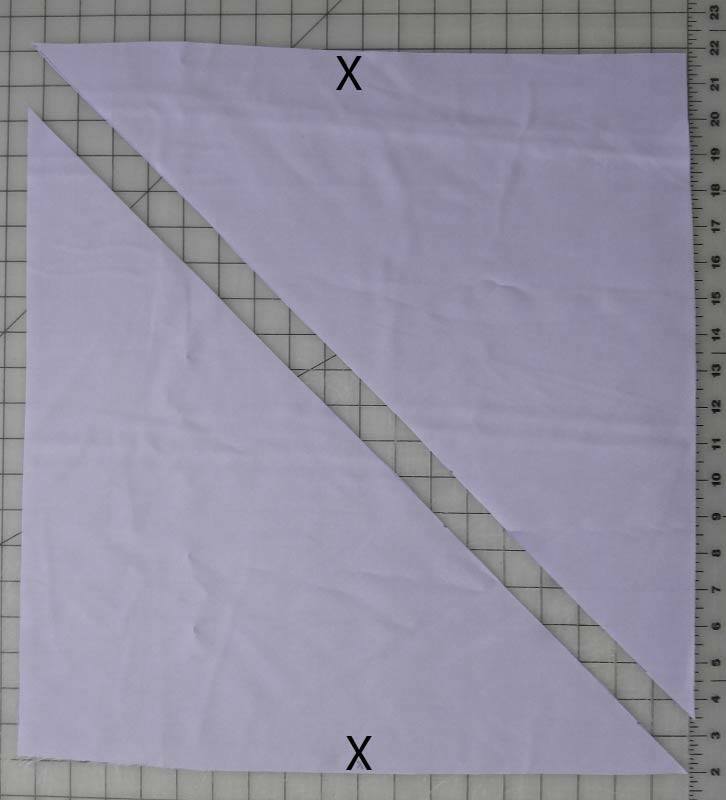 Shift your triangles so that 1/4” is not overlapped on both sides. Pin in place and using a 1/4” seam allowance, sew as shown in the picture above. 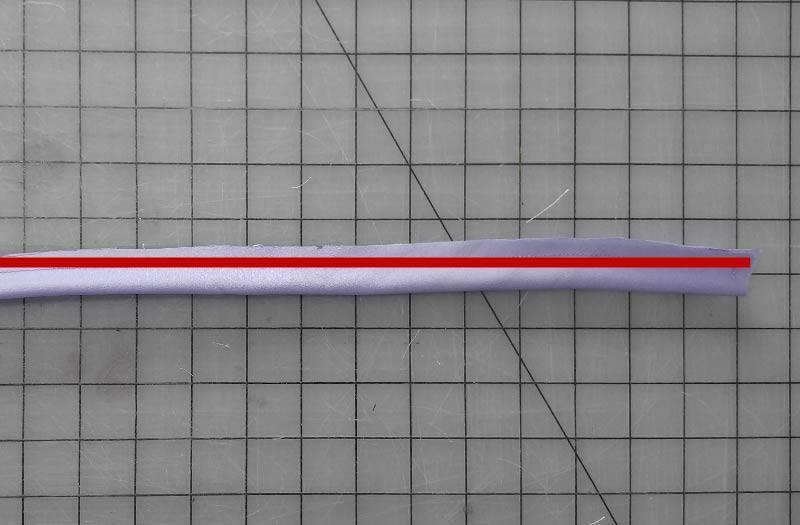 Step 3: Press the seam open as shown. You now have a parallelogram! 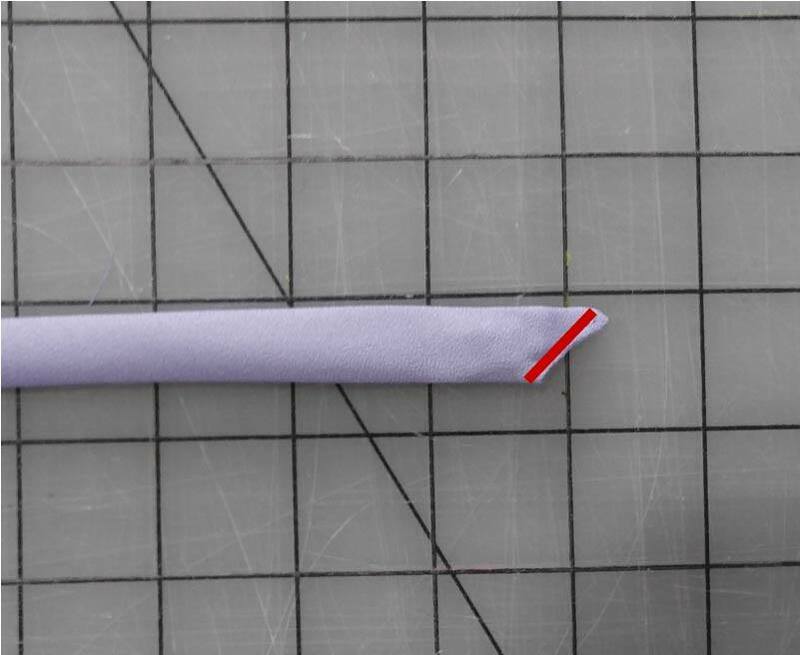 You can trim off the tiny 1/4” extra on each side so the ends with the seam allowance are straight. 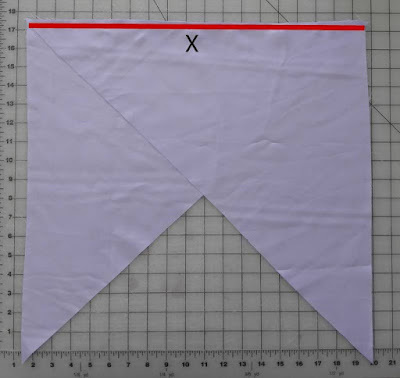 On the wrong side of the fabric, use a fabric marking tool of choice to create horizontal lines that are parallel with the top and bottom of your fabric, 2” apart. 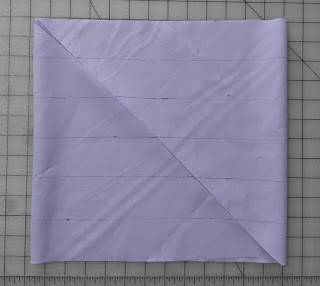 Step 4: Fold your parallelogram, right sides together so you can see where the lines you just drew match up. 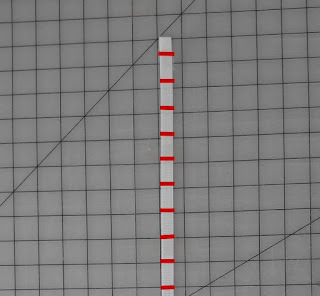 Step 5: Now shift your lines by pulling the corners in opposite directions so that your lines on the left side are now lined up with the line that was previously above it on the right side. This will create your spiral as we cut the bias lines. 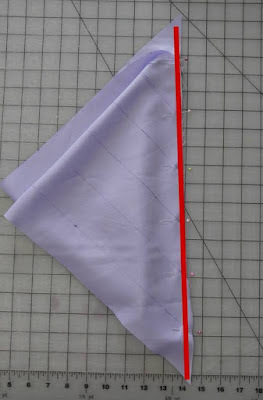 Step 6: Pin the fabric, right sides together, where these lines will cross 1/4” down. 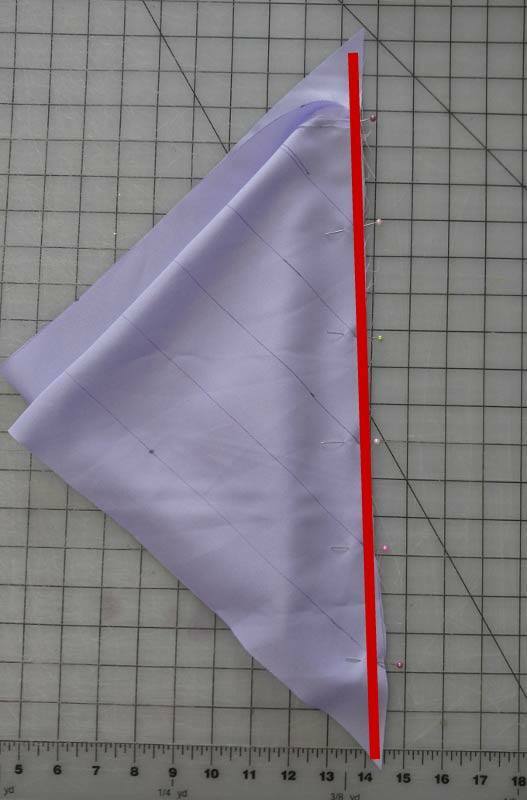 The lines will look like they are going opposite directions on either side of the seam allowance. The lines meet exactly where my pin enters the fabric. 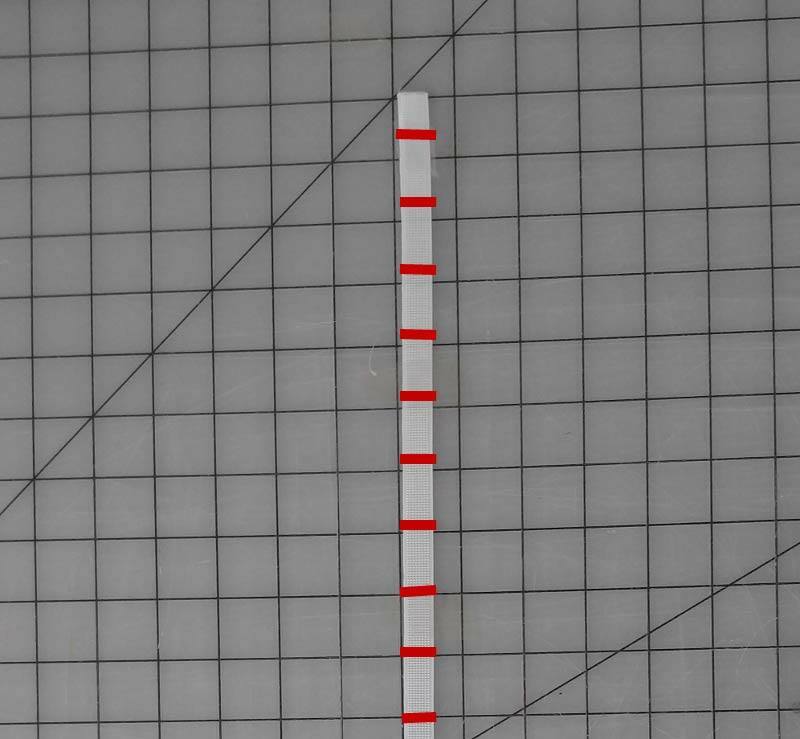 Check both sides to make sure they are intersecting at 1/4”. 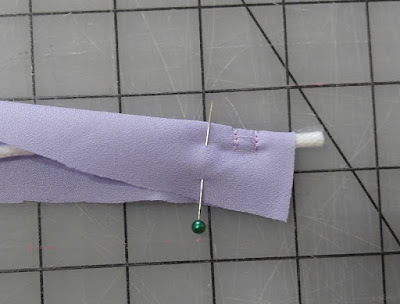 Using a 1/4” seam allowance, sew your loop of fabric together. 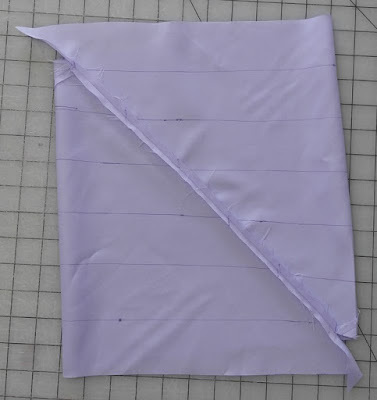 Step 7: Press the seam open as shown. You can now see that your lines are all matching in the loops. 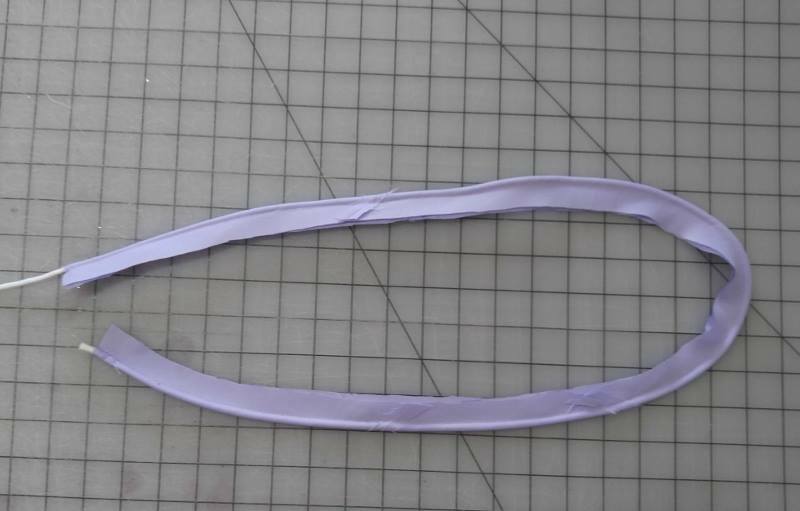 Step 8: Start at either end of your loop and cut your fabric along the line, creating a long strip of fabric. 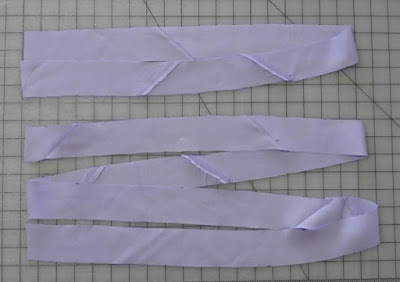 Step 9: Next you will need to cut your bias strip down to the sizes you will need. 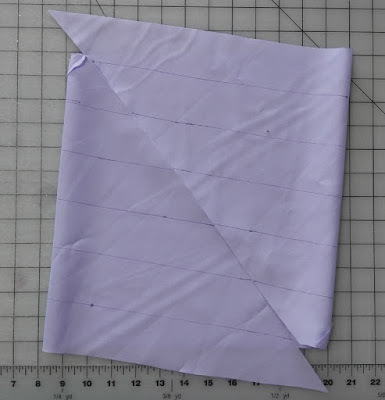 Trim off the triangle points so you have a rectangle. Cut one strip to be 4 times the length you want your finished corset. This will be for your loops. 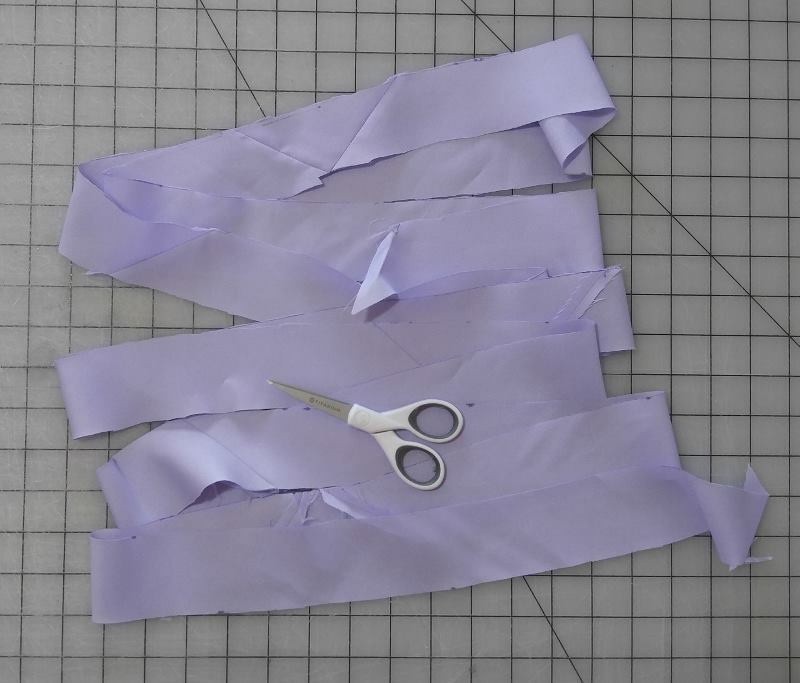 Cut a second strip to be 8 times the length you want your corset. This will be for the lace up. 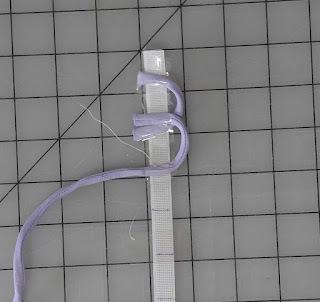 Step 10: Take the bias strip for the loops and fold it around your cording so that right sides are together and the cording is in the inside. 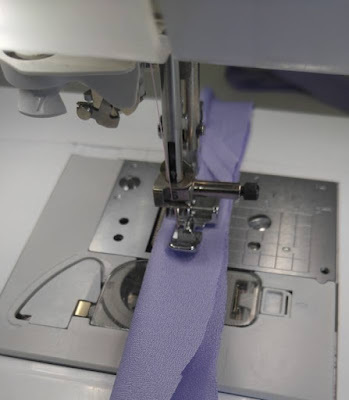 Stitch back and forth across the top several times to secure the cording. Stitch again 1/4" below the first row of stitching. 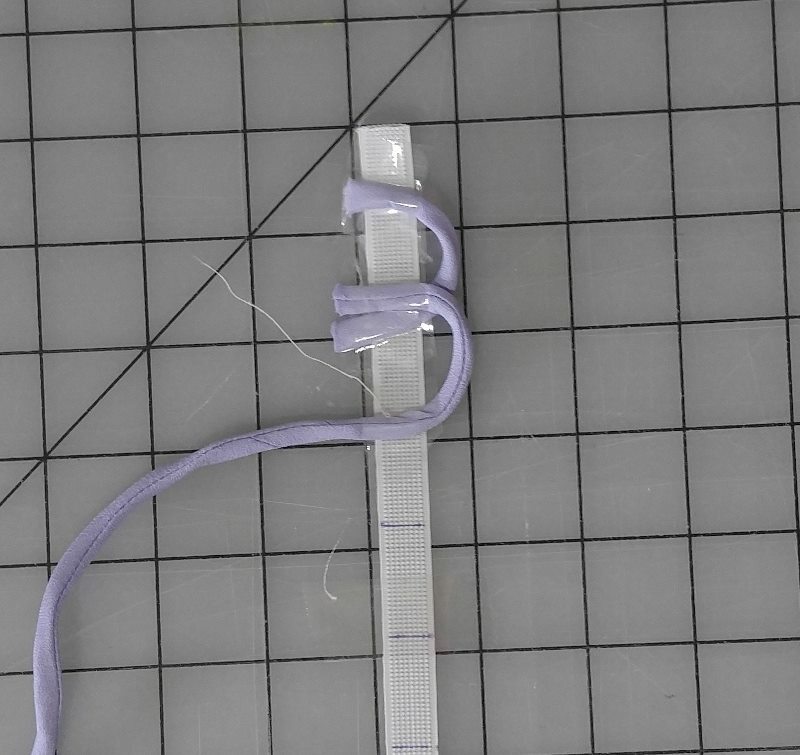 Step 11: Using your zipper foot, stitch down the length of the cording so it is encased in the bias tape. 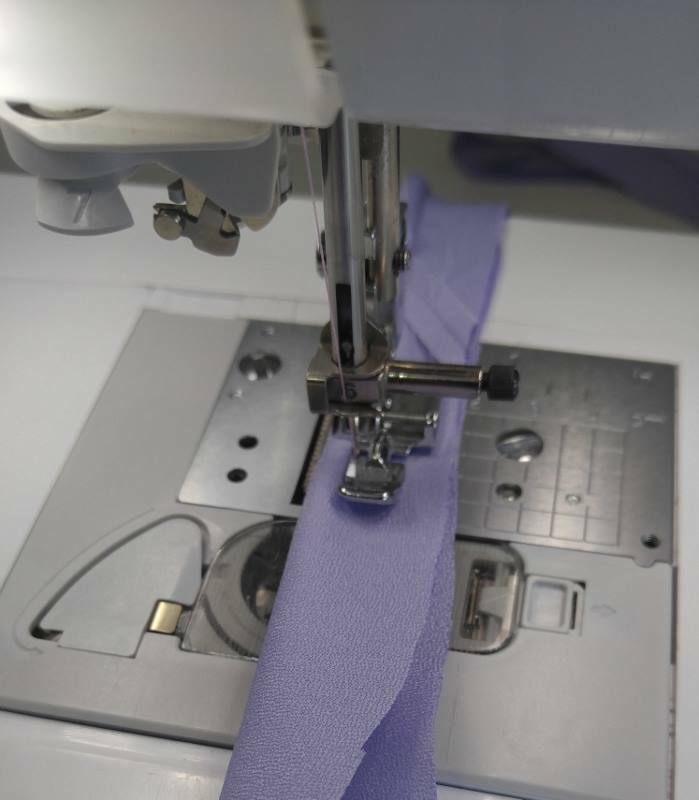 Stitch as close to the cording as you can, but be very careful you do not catch the cording in your stitching. 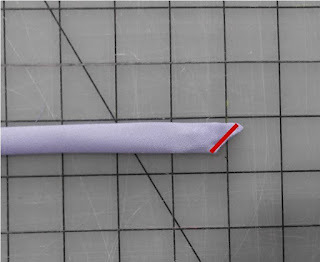 Step 12: Trim your seam allowance down to be about 2 times the width of the cording as shown. 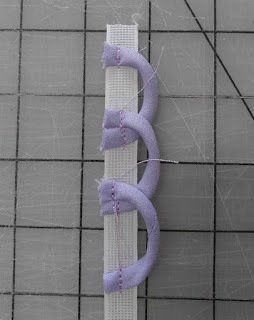 Step 13: The end of the cording should be sticking out of the end of your bias strip. Pulling on it you should be able to turn your bias strip right side out. 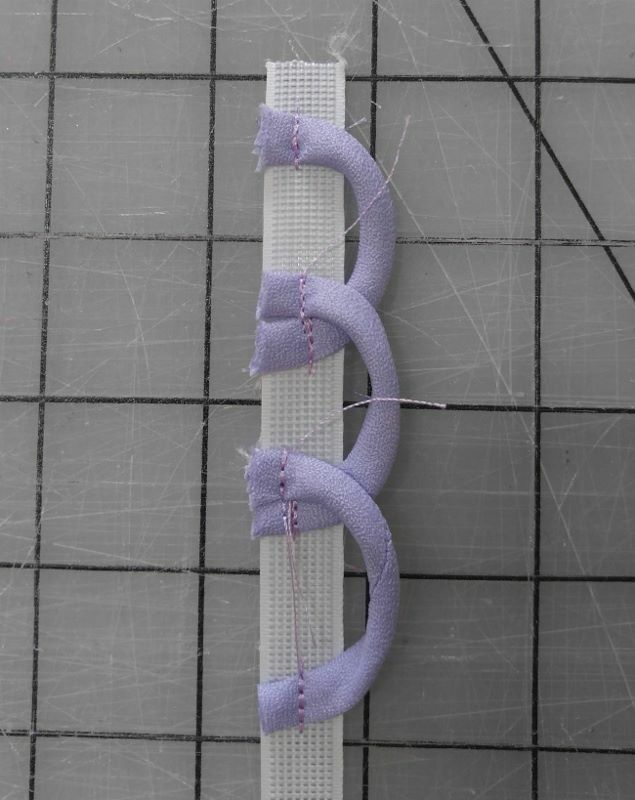 This will give you a tiny tube to make loops on your corset. Cut off the end where to cording was attached. Set aside. Step 14: Next we will make the lace up for the corset. 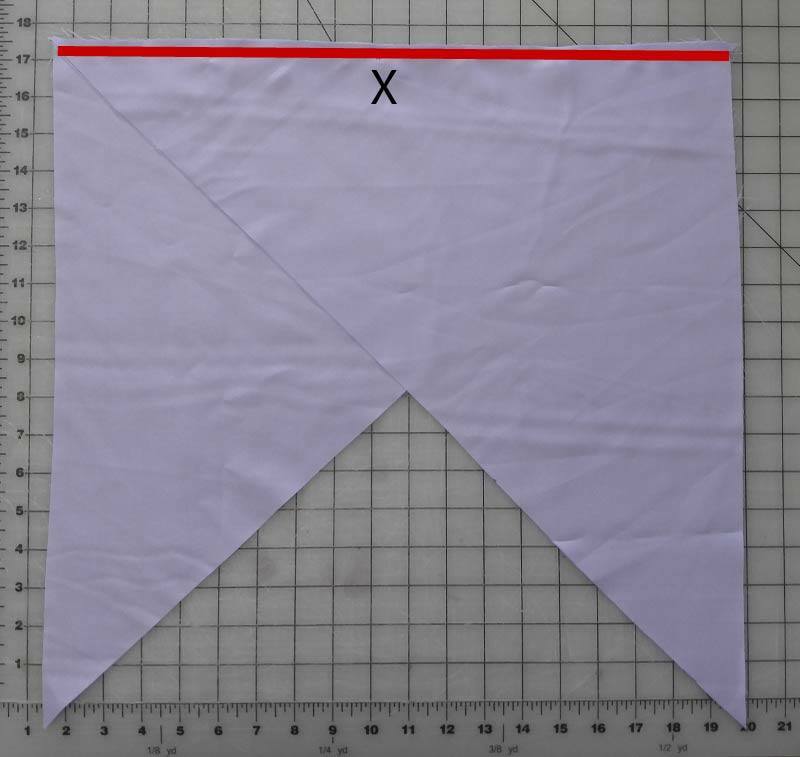 Fold the bias strip in half right sides together and sew down the long side with a 1/4” seam allowance. Step 15: Turn the lace up right side out and press. You may find it easier to turn by using a safety pin to help you. 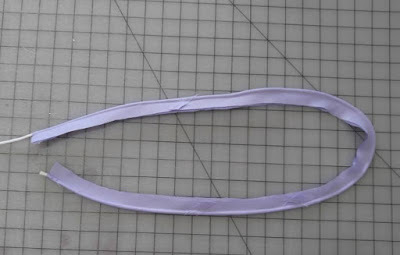 Step 16: Trim the ends of the lace up to be at an angle. Tuck in 1/2” on each end. Stitch in place as shown. Your lace up is now done. Step 17: Take your boning and mark the placement for the loops. Make a mark 1" from the top. Then make a mark every 3/4" below that down the entire boning. Step 18: Take your loop fabric. Pin it to the boning just above your first mark. Pin it again to the boning just below the second mark. 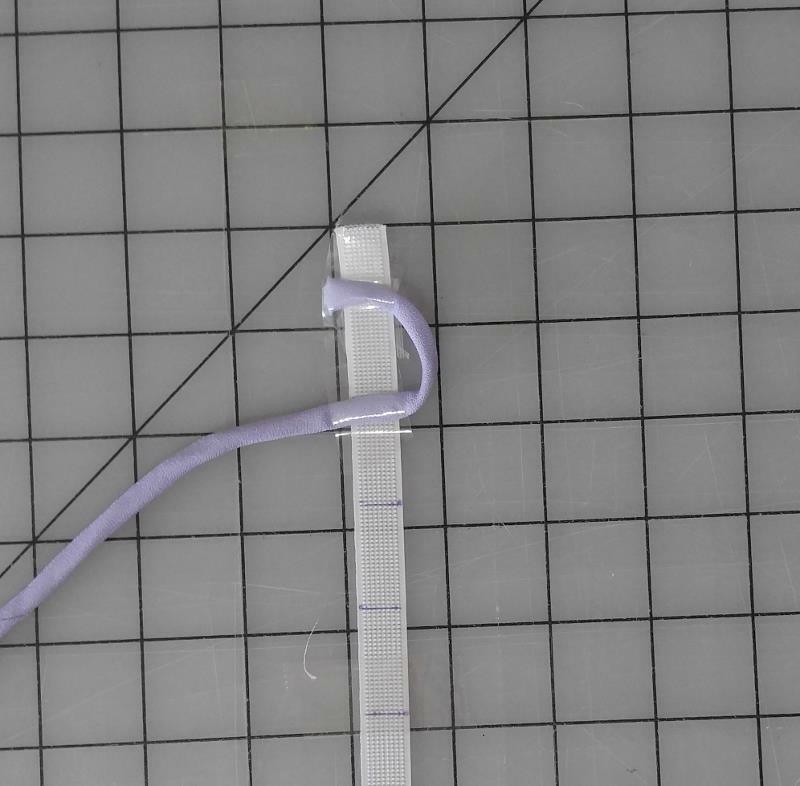 The loop should extend only 1/4" past the edge of the boning. If you are finding it difficult to pin your loops. Use tape to hold them in place. 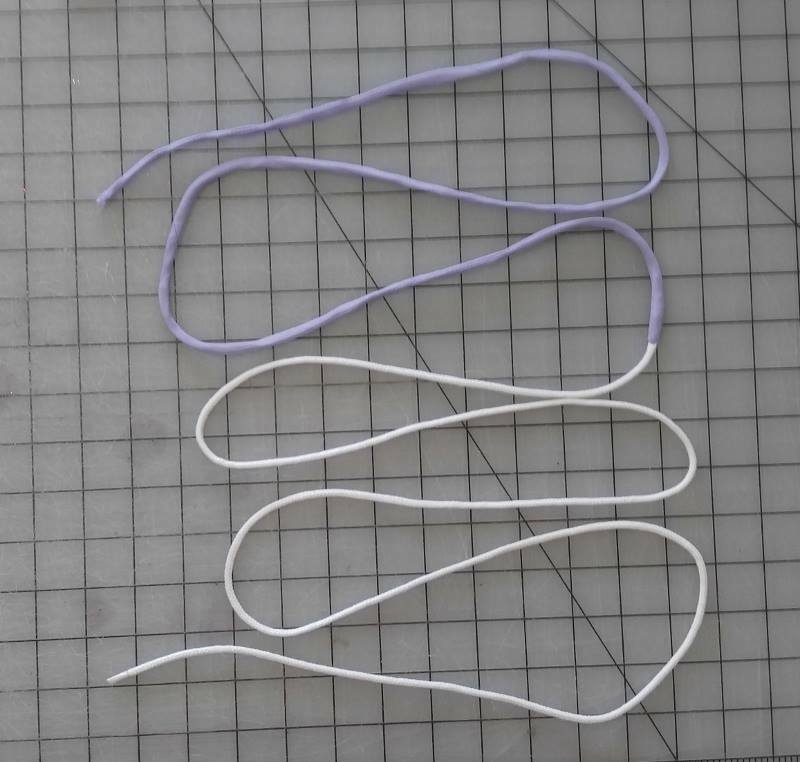 Step 19: Sew back and forth across the loop on each end. 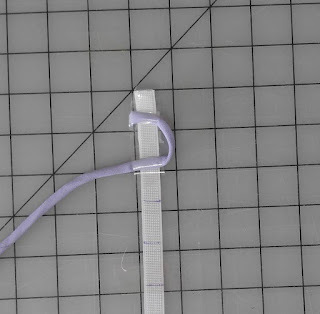 Trim off the excess loop. Then take the remaining loop length and pin it just above the loop on the boning. Then pin the other end just below the next mark. 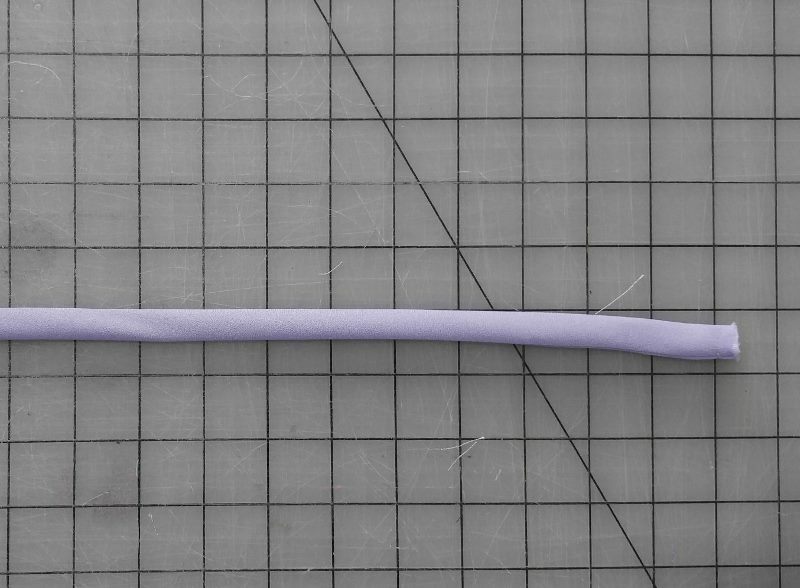 Make sure to keep the loops even by only extending them 1/4” from the boning. 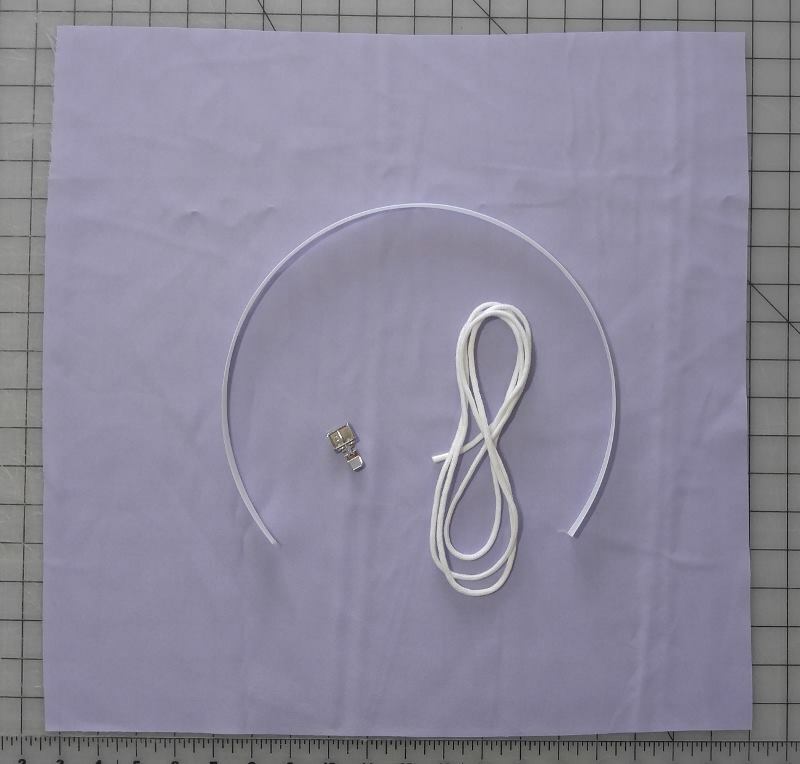 Step 20: Sew the loop in place again by stitching back and forth across the loop several times. 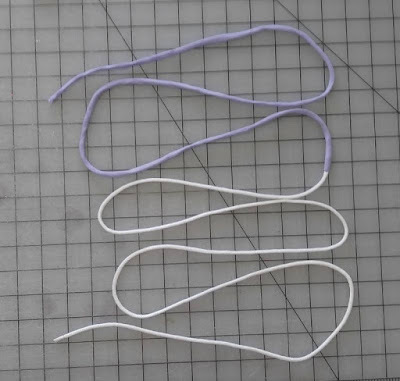 Trim off the excess loop strip. 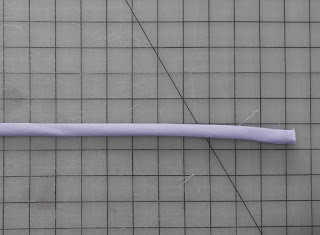 Repeat step 19-20 until you have sewn loops down the entire length of your boning. Discard the excess loop strip. Thank you so much to Brooklyn for this fabulous tutorial! We would love to see and celebrate what you make. Please share your beauties with us in our Facebook Group or on Instagram @CKCPatterns.